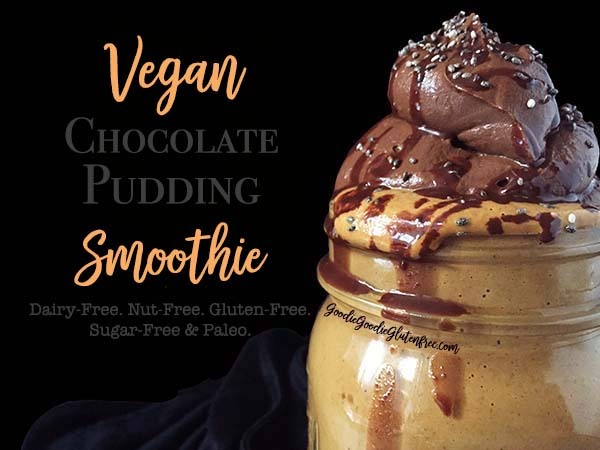 Healthy Vegan Chocolate Pudding Smoothie! Say what? If I told you this smoothie was healthy would you believe me? 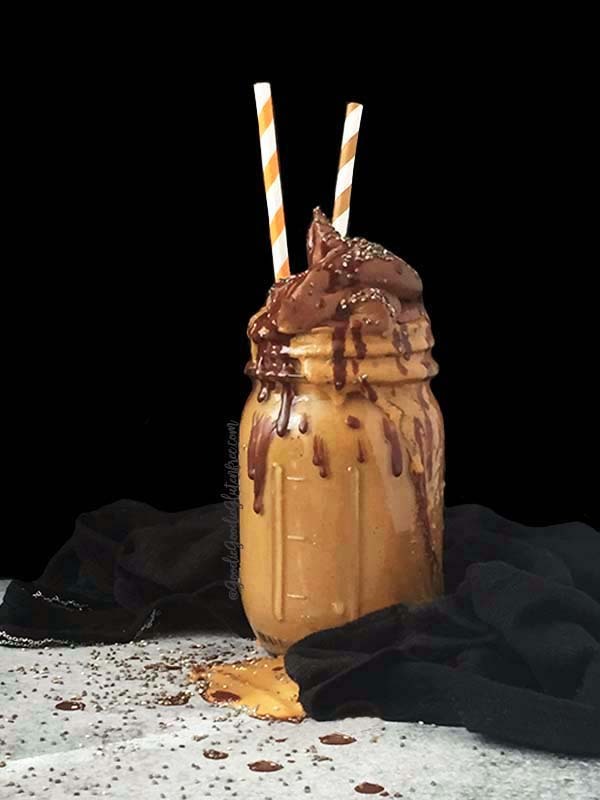 If I told you this smoothie was sugar, dairy, nut-free, paleo & vegan approved and still tasted like the darn best decadent chocolaty smoothie ever – would you think I was joking? Because I’m not friends! This is fo REAL! This is the type of smoothie you dream about, you know that super guilt free one that tastes like you should feel guilty? The one that feels like you just ate dessert and kinda feel bad because it’s breakfast time…Yeah, that kind. It’s creamy, smooth, decadent and all you can taste is the chocolate with a twist of cinnamon. And this is the exact point of my treats and sweets. Deprived? I think not! No never! Life can taste pretty sweet and decadent even with allergies, limitations, food sensitivities, chronic illness, autoimmune and needing or wanting to live a healthy lifestyle. There are some serious diets out there, and I have been on most of them – and had I not (doctor’s orders) tried out these diets and made them part of my lifestyle, I NEVER would have been able to learn how to develop recipes THIS creatively. I always prided myself on my creativity, but since living and eating clean, my creativity has expanded beyond my wildest dreams. Just don’t ever think your life has to be bland, okay? Because It totally doesn’t. Healthy can easily be DELICIOUS! Don’t believe me? Scroll down a bit, go ahead…drool over this smoothie – and then make it! I’ll tell you how I eat this divine piece of goodness. First I use a spoon and eat the chocolate avocado ( yes I said avocado) pudding! That decadent chocolate pudding is off the hook! No joke!! Today I used that same avocado pudding recipe for a raw vegan tartlet I’m developing and I gave it to a few people in my building, ya know to taste test. Besides saying how amazing it was, they asked me what kind of chocolate I used so they could buy it. I said “avocado”. After I devour the chocolate avocado pudding, I pluck in a straw and drink the rest. My favorite way to drink a smoothie is ice cold, so when you make this-make sure your base is cold. Unless of course you are that kind of person that likes warm smoothies. And if you are, well then by all means drink it the way you like! I’m just telling you how I dig them. Your call if you wanna eat this for dessert or breakfast. It’s loaded with protein, healthy fats, fiber and veggies. And OMG – It’s fruitless – unless you count avocado as a fruit (since technically it is one). But don’t worry, you won’t miss the non existing fruit in this smoothie. It’s just so good and so creamy the way it is! In a high-speed blender blend all ingredients except the ice till really smooth. Because there is frozen cauliflower and sweet potato, you will have to blend a bit longer. It should NOT taste grainy, if it does, it needs to be blended more. Taste it along the way to be sure. Once smooth, add the ice and blend again. Pour into a mason jar or glass and set aside or put in the freezer/fridge to give it an extra chill while you make the toppings. Using a food processor add the avocado flesh, the cocoa powder and the pink salt and blend until smooth. While blending add the liquid stevia. Process until pudding like consistency and then either put into a disposable pastry bag (get it here), or set aside in a dish. In a microwave melt 1/4 cup of sugar-free chocolate chips at 15-30 second intervals, mixing each interval with a spoon. Once the chocolate is melted, then add UP to 1 1/2 tablespoons of coconut oil. Using a spoon add teaspoon by teaspoon till you get the desired drippy consistency. Mix well. 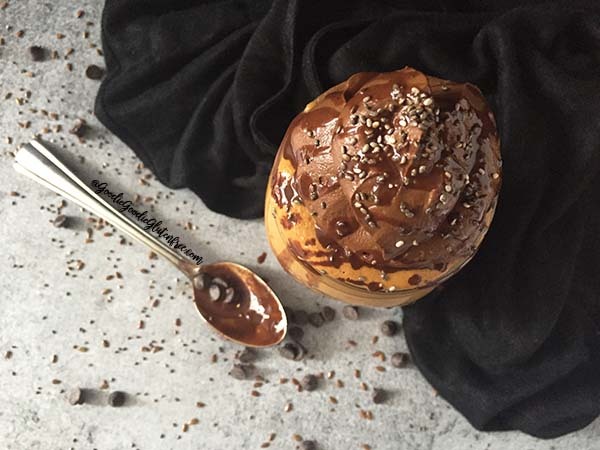 Remove the smoothie from the freezer/fridge and using a disposable pastry bag with the bottom cut straight across at the tip or at an angle (for piping purposes) pipe chocolate pudding on top of the smoothie. Then drizzle melted chocolate on top. You can use a spoon or a culinary chocolate making bottle with a nozzle and drizzle the chocolate. Top with additional chia seeds as sprinkles. For my superfoods I used Nuts.com – because they have a certified gluten-free section that measures at 5ppm. If you want your avocado pudding to be sweeter, eliminate the stevia and use 3 teaspoons of pure maple syrup. If you cannot get access to TigerNut milk, get my recipe here or feel free using another plant based milk other then hemp seed milk. 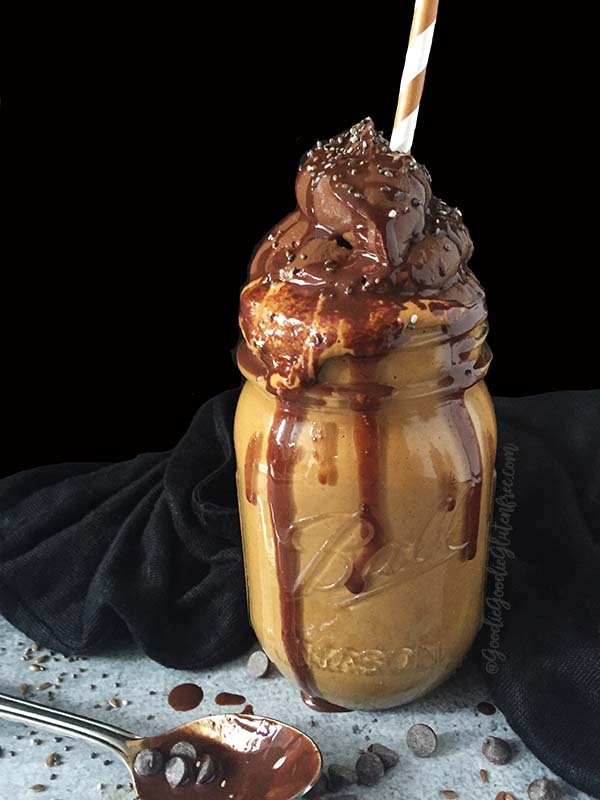 Creamy Chocolaty decadent vegan smoothie that is sugar, dairy, nut-free & paleo approved. You won't believe it's sugar-free! In a microwave melt ¼ cup of sugar-free chocolate chips at 15-30 second intervals, mixing each interval with a spoon. Once the chocolate is melted, then add UP to 1½ tablespoons of coconut oil. Using a spoon add teaspoon by teaspoon till you get the desired drippy consistency. Mix well. For my superfoods I used Nuts.com - because they have a certified gluten-free section that measures at 5ppm. || My favorite brand of pink salt is Himalasalt - but you can also use sea salt. || If you want your avocado pudding to be sweeter, eliminate the stevia and use 3 teaspoons of pure maple syrup || If you cannot get access to TigerNut milk, get my recipe for this homemade milk on my blog or feel free using another plant based milk other then hemp seed milk.